TrepStar is directly integrated with several shopping carts including Shopify and WooCommerce. If you sell on Amazon, eBay, Etsy, PayPal, Square or any other popular selling channel, your TrepStar CD/DVD/USB orders can be automatically submitted to TrepStar through our ShipStation Integration. ShipStation integrates with almost every shopping cart. If TrepStar does not integrate with your shopping cart directly (the list below), first, sign up with ShipStation. Then, orders from your shopping cart will flow into ShipStation, and that order data will be automatically submitted to TrepStar by using the TrepStar ShipStation integration. Amazon: Click Here to find out how to integrate with Amazon. 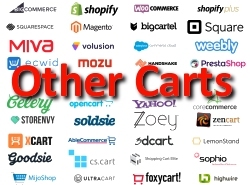 1ShoppingCart: If you already use 1ShoppingCart Professional Click Here to learn how to easily automate ordering. eBay Seller: If you use ShipStation, Click Here. Otherwise if you sell on eBay, Click Here to learn how to easily automate ordering for eBay sellers. This uses the PayPal IPN (Instant Payment Notification) system. E-junkie: If you already use E-junkie as your shopping cart, Click Here to learn how to easily automate ordering. PayPal IPN: If you use ShipStation, Click Here. If you use PayPal buttons or shopping cart, Click Here to learn how to easily automate ordering using the built in PayPal IPN (Instant Payment Notification) system. ShipStation: Click Here to automate orders from all selling channels and shopping carts supported by ShipStation. Shopify: If you use ShipStation, you may choose to use the ShipStation Inegration or the direct Shopify Integration to learn how to easily automate ordering. ThriveCart: If you already use ThriveCart shopping cart, Click Here to learn how to easily automate ordering. UltraCart: If you use ShipStation, you may choose to use the ShipStation Integration or the direct Ultra Cart Integration to learn how to easily automate ordering. WooCommerce: If you use ShipStation, you may choose to use the ShipStation Integration or the direct WooCommerce Integration to learn how to easily automate ordering. 1) Find your shopping cart in the ShipStation list. 2) If your cart is listed, then sign up with ShipStation and use the TrepStar ShipStation Integration directly from within ShipStation. If your shopping cart is not listed above, and you don't use ShipStation, you can program a direct integration to TrepStar using our generic HTTP gateway. TrepStar Generic HTTP Gateway API: Any programmer can use our HTTP Gateway API to send order data to TrepStar. This is the most generic way to program your system to send the order data to our server when your customer orders from your website. You have full control of how and when your system sends order data to our server. Click Here to learn how to automate ordering using our http gateway. Spreadsheet Ordering: Can you export your order data into a spreadsheet format? If so, learn more about spreadsheet ordering. Are you using TrepStar to manufacture and ship products directly to your customers one at a time when your customer orders from your shopping cart, Paypal buttons, or eBay? You probably don't want to fill out the TrepStar order form each time a customer orders your product. Many TrepStar publishers automate the order process. Option 1: You may configure order automation yourself at no charge. Option 2: You may want to consider the TrepStar spreadsheet order process. Order automation is non trivial which means each case is different and it requires the help of our programming staff. We charge a $50.00 per hour consulting fee with a 1 hour minimum charge ($50.00). Depending on which cart you use, it could take between 1 and 10 hours. Once we find out a little more about your project, we can give you a more accurate estimate. We offer this service if you need help setting up order automation to one of our listed integrations. We also may consider creating a new integration to a system we have not yet programmed. If you would like order automation support, send an email to help@trepstar.com to let us know some of the details.